Widely regarded as one of the most respected and sought-after musicians in the music world, Brazilian-born Eumir Deodato has racked up 16 platinum records to his credit as artist, arranger or producer with combined sales of well over 25 million records in the USA alone. His discography, including compilations and all his work as arranger, producer and keyboardist, surpasses 450 albums. He has also had the honor of performing with the St. Louis Symphony (which backed him on his superb Artistry album), the Cincinnati Symphony, the New York Philharmonic and the Orchestra di Musica Leggera dell’Unione Musicisti di Roma. In addition, several artists over the years have covered his songs, including George Benson, Lee Ritenour, Sarah Vaughan and The Emotions to mention just a few. And yet, in spite of all of his varied triumphs, honors and distinctions over the years, the multitalented, multi-instrumentalist will probably forever be associated with one song – his innovative rendition of Richard Strauss’ classical opus Also Sprach Zarathustra (or more commonly known as the theme to 2001: A Space Odyssey). That single compelling song, which first appeared on his 1973 debut album for CTI Prelude, sold at least five million copies and earned Deodato his first Grammy Award, instantly moved him to international stardom and setting a course for his remarkable ongoing career in music. Thirty years later, that same tune has found its way into the repertoire of the jam band Phish, a testament to Deodato’s enduring influence. Born in Rio de Janeiro, Brazil, from Italian and Portuguese origin, Eumir Deodato got his start by playing the accordion at age 12. Shortly thereafter, he started studying piano as well as orchestration, arranging and conducting. Strictly self-taught, he immersed himself in theory books while spending countless evenings sitting behind orchestras and carefully observing how each part was played. His first break came at age 17 when he arranged and conducted his first recording session for a 28-piece orchestra. It wasn’t long before Deodato became one of the most active and respected arrangers and pianists in Rio’s busy music scene, recording for such artists as Milton Nascimento, Marcos Valle, Elis Regina and Antonio Carlos Jobim. 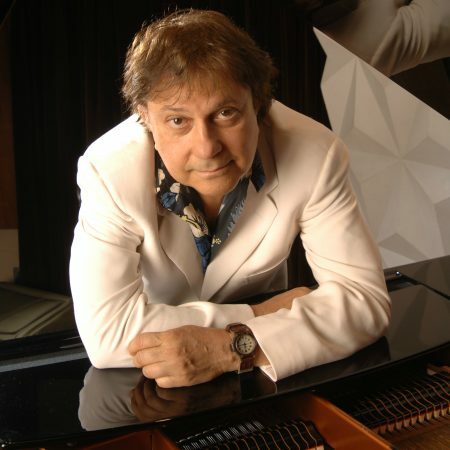 In 1968, Deodato moved to New York and began working with Luiz Bonfa, the legendary composer of Black Orpheus, while also doing extensive studio work for Astrud Gilberto, Walter Wanderley, Antonio Carlos Jobim, Marcos Valle and many other Brazilian artists who were living in the Big Apple at the time. When writing the arrangements for Astrud Gilberto’s Beach Samba , he became acquainted with producer Creed Taylor, who hired him to arrange for other CTI artists like Wes Montgomery, Stanley Turrentine, George Benson, Paul Desmond and Tom Jobim. His reputation in the fields of pop and black music was strengthened by his arrangement work for Frank Sinatra (Sinatra & Co.), Roberta Flack (Killing Me Softly, Chapter Two, Quiet Fire) and Aretha Franklin (Let Me In Your Life). Following a performance at the Hollywood Bowl with the CTI All-Stars Band in 1972, Deodato started recording his record. His debut appearance as a leader, billed as 2001 Space Concert, was held at the Madison Square Garden in New York City in 1973. After seven years of world-wide touring (including Australia, Japan, Canada, South America, Europe) and eight coast-to-coast tours of the States, Deodato decided to concentrate on studio work once again. Besides highly successful solo albums for the CTI, MCA, Warner And Atlantic labels, his work as a producer/arranger earned him several more laurels. One of his first productions was Kool & The Gang’s #1 pop single Celebration. He followed that success with production or arranging work for Earth, Wind & Fire, Michael Franks, Gwen Guthrie, Chuck Mangione, Breakfast Club, The Dazz Band, One Way, Con-Funk-Shun, Kleeer, Pretty Poison, Kevin Rowland (Dexy’s Midnight Runners), White Lion and Brenda K. Starr, for whom he produced the pop hit I Still Believe in 1987. Deodato also had three other multi-platinum albums for Kool & The Gang’s Ladies’ Night, Something Special and As One. In the 90’s, Deodato continued to be a vital force on the pop scene through his work with Icelandic singer Bjork. In addition to arranging her last three albums: 1995’s Post, 1996’s Telegram and 1997’s Homogenic, Deodato produced a highly praised acoustic version of Bjork’s Isobel, sub-titled Deodato Mix, which became a club scene favorite. He has also produced material for French singer Clementine (also touring Japan with her as a special guest in 1994), arranged and produced a top 10 single for Brazilian singer Gal Costa (1996) and has performed as guest conductor with Bjork both in Brazil (1996), and in the States at the Tibetan Freedom Concerts at Downing Stadium (1997). In 1998, Deodato arranged for Brazilian pop acts Titans (Vol. II, with sales over 500,000 copies) and Carlinhos Brown (Omelete Man) as well as for the latest album by pop-rock band Penelope Charmosa (released in 1999). He was also special guest on a project by Japanese pop star Akemi Kakihara, recorded in London during the summer of 1998. In 1999, he scored Bossa Nova, a Bruno Barreto film starring Amy Irving, and the following year produced the CD of that score for Verve Records. His most recent projects including production work for French rock singer Damien Saez, Brazilian-Japanese singer Lisa Ono and for jazz singer Ann Hampton Callaway. Deodato has also worked on several movie scores, including The Onion Field, The Black Pearl, Ghostbusters II, White Nights, The Girl From Ipanema, The Adventurers (recorded with A.C. Jobim and the London Symphony Orchestra), The Gentle Rain, Target Risk, The Reporter, Beat Street, Body Rock and Bossa Nova. His recordings have also been widely used on major movies such as Being There and The Exorcist. In November 2001, Deodato participated in a benefit concert in New York City where he played only 1 song (Also Sprach Zarathustra: 2001). The reaction was so fantastic he got encouraged to go back doing concerts. By 2002 he lined up a few selected presentations, starting with a concert at the Vienna Opera House, as part of the Vienna Summer Jazz Festival. That was followed by Villach (Austria), Pori (Finland), The Hague (North Sea Jazz Festival), and many others that followed, like Capetown (South Africa), Rome and Rimini (Italy), Amenia, NY (World Peace Organization), Antigua, Guatemala etc. Meanwhile, in 2002 he worked with Milton Nascimento in Rio de Janeiro, which generated a Latin Grammy for the song Tristesse as best Brazilian song of the year, then miscellaneous work with different artists, including Barbara Mendes, Ana Carolina, Fernanda Abreu and more recently, KD Lang for her new record slated to be released in the Spring of 2004. At this moment, January 2004, Deodato is working on some String Orchestra arrangements for the 2004 KD Lang World Tour. There will be more concerts in the horizon as well as more arranging work including a possible new record. Deodato est consideré comme étant le musicien le plus respecté et demandé du monde entier. Il a eu le privilège de jouer avec l’orchestre philarmonique de New York et de nombreux artistes tels que Sarah Vaughan ou George Benson ont repris ses chansons. Pianiste, arrangeur et producteur de bossa nova, jazz et pop, le Brésilien Eumir Deodato obtient son premier succès en 1973 avec le thème « Also Sprach Zarathustra » détenteur d’un Grammy Award. Il se distingue particulièrement dans des albums jazz funk richement orchestrés, des bandes originales et la production, de Frank Sinatra et Antonio Carlos Jobim à Björk et Christophe. Né le 22 juin 1943 à Rio de Janeiro (Brésil), Eumir Deodato (littéralement « don de Dieu ») débute comme ingénieur du son à l’âge de 17 ans, pour ne plus quitter les studios un demi-sièce après. Pianiste/claviériste, arrangeur et producteur, il orchestre seul son premier album Prelude (1973) dont le thème « Also Spracht Zarathustra » (2001, Odyssée de l’espace) lui vaut un Grammy Award. Poulain prodige du label CTI de Creed Taylor, Deodato fait une seconde tentative infructueuse avec Deodato 2 et « Rhapsody In Blue ». Durant la décennie 1970, outre ses albums riches en vitamines jazz, funk et bossa nova, Deodato arrange les albums d’Astrud Gilberto et produit à tour de bras des poids lourds du showbiz comme Frank Sinatra (Sinatra & Company), Antonio Carlos Jobim, Kool & The Gang, Bette Midler, Stanley Turrentine, Aretha Franklin, Roberta Flack ou Michael Franks. La carrière personnelle du Brésilien poursuivie sur MCA Records (1974-76) puis Warner Bros (1978-1989) est également ponctuée de hits comme le disco « Watusi Strut », « Uncle Funk » ou « SOS Fire In The Sky » et « Are You For Real » en 1985. Il travaille par la suite avec d’autres stars comme Björk (Homogenic, 1997), Christophe (2007) ou le rappeur Lupe Fiasco (The Cool, 2007). La même année sort Eumir Deodato Trio – Live In Rio, retour aux sources bossa jazz, suivi de l’éclectique The Crossing en 2010.